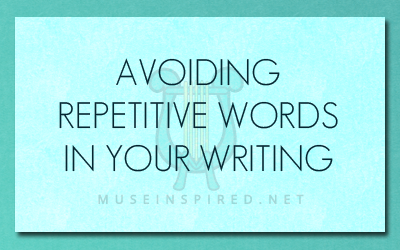 For an individual that loves to spend hours every day writing paragraphs upon paragraphs of content, whether it be for a novel, fanfiction, or even a drabble, we often find ourselves trapped by our own love of specific words. Every author will have a sack containing their favorite vocabulary. After all, the words we choose create the style that makes up our unique voice. However, the downside to those go-to words and a frequent writing schedule is that we’ll forget to diversify. Repetitive words (even amazing words) will leave your work stale or even diminish the impact you were trying to make with a certain sentence. Take a look at some of your writing. Do you see any words in there that you seem to use all the time? Repeatedly? Several times in the same scene? We’re not talking about the common words like “the” or “and”. Descriptive words! Said. Awesome. Good. Nice. Mad. Engorged. If you find yourself over using a word, switch it out with something different. You might find that changing that one single world can add a whole different kind of atmosphere or oomph to the scene. Adding additional words can flesh it out even more. The food tasted like a soggy wet box with salt dumped on it. The food tasted like a sweet and spicy mix of heaven. Before you break out that thesaurus, consider whether or not the new word is something your readers will understand and if it actually makes sense. Where it’s fun to occasionally toss in unique words that no one has ever heard of before, if you pepper your entire work with them you’ll end up with paragraphs of nonsense. Read the paragraph below. Rewrite this paragraph using more interesting words and sentences. Do not use any of the descriptive words that are already in the paragraph. You can make this scene as long or as short as you want, just make sure not to repeat yourself. He walked into the dark room. On the table was a brown leather bound book. He picked it up and began to read. Inside were beautiful pictures. More colorful images filled his vision with each turn of the page. His mind was consumed by the enchanting words. He dropped the book to the floor and fled from the room. The sound of chilling laughter followed him. He walked into a room engulfed in shadows, each step he took echoing ever so slightly in the background. In the center of this room there was a candlelit table whereupon a book crafted with leather resided. Illustrations filled his mind with each gripping sentence that urged him to turn to the next page, then the next, then the next. Abruptly, he let the book fall to the floor and sprinted from the room, an eery cackling accompanying him as he made his escape.